A few week ago I posted my standard cheese filled meatballs recipe (HERE) and at the end of the post I mentioned my lamb and goats cheese twist on them. So here I am wiring that very recipe for your guys. Looking back at my posts it doesn’t seem like it, but I am a lamb lover. In reputable restaurants I will always go for the lamb, not in unknown ones however as badly cooked lamb is just horrid. While the beef and cheese meatballs are the ultimate comfort food, that would be loved by the whole family, I believe this version will be mostly appreciated by the adults due to the goats cheese strong taste, also unlike in the beef ones, where the spinach was chopped into pieces, the spinach leaves are left whole for this recipe. If you are looking for a healthier option I also have some awesome chicken Meatballs which you can find HERE. The sauce and pasta steps are COMPLETELY optional. 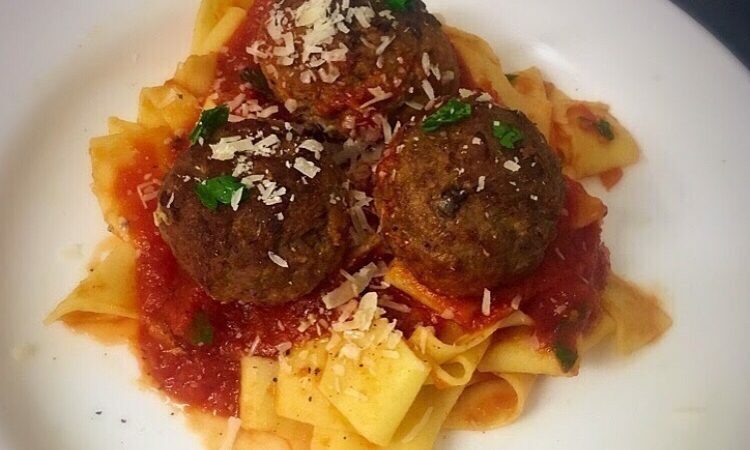 I have had these meatballs in a salad and it works really well. Now mix all your ingredients except for the cheese and spinach make sure everything is nice and incorporated. Add more breadcrumbs if needed. Take some of the mixture and flatten it out in your hand, lay 1 spinach leaf in the middle and put 1/2 teaspoon of goats cheese on the leaf. Cover with another leaf and wrap the meat around it. Make sure that the cheese isnt seeping out. I usually gently fold the leaves over it to keep it inside. Repeat until you run out of meat. In a skillet heat up the olive oil and add your meatballs, you don’t need to cook them through just make sure the outside is cooked so as not to damage them in the oven. Now gently transfer them to baking dish and bake for around 15 minutes. Use this time to make your sauce. and pasta. Once the meatballs are cooked add them to the sauce and keep the heat on low just to keep everything hot. Serve with fresh egg pappardelle, a meatball sub or a salad. The choice is yours. For the pictures I went for a full pig out experience with the pappardelle and some grated parmesan.